10:00-10:15 Visitors arrive. Visitors to park at Wistaria and booked in by Security. Attendees are advised that the house does not have disabled access, and that the gardens will include changes of levels. Please email Rebecca via general@lutyenstrust.org.uk if you have any concerns about access. Thursday 18th May 2017, 10am-3:30pm This event has been temporarily postponed. More details will be added when available. Meeting Place: Parking at Wistaria RG7 4DB. A mini-bus will be available to take attendees to Folly Farm. Folly Farm was a vernacular building originating in the 17th century as a small timber framed cottage, evolving in the late 18th century into a farmhouse. It was built in the Kennet valley near Sulhampstead on the outskirts of Reading. Geographically there are no spectacular natural features or views comparable to those of the Surrey Hills. Robert Fenn, a well-known horticulturist lived there for close to thirty years. It was purchased from Fenn by H. H. Cochrane in roughly1905 and he commissioned Edwin Lutyens to recast it as a small country house. In 1911 it was purchased by Zachary Merton (d. 1915). It is in that form that the fame of the house was established. During the 1920s and 30s the house was owned by the wine merchant, Arthur Gilbey (1861-1939) and during the Second World War the Gilbey family allowed the house to be used as a maternity home. The politician, the Hon. Oliver Stanley (1896-1950) purchased the house in 1946, but only lived there for a short period before his death when it was sold in 1951 to the Hon Hugh Astor (1920-99). Sir Desmond Pitcher (b. 1935) purchased the house in 1999. His tenure was also short, and the present owners acquired Folly Farm in 2007. The house and gardens have always been valued and enjoyed, though over the passage of time it was altered to suit changing social conditions and different taste in interior decoration. By train: the nearest station is Aldermaston (GWR) – 6 min drive from Folly Farm. From here take the “1 Jet Black” bus from Padworth Lane towards Reading Town Centre. Alight (6 stops) at Spring Inn Pub. Folly Farm is a further 1 mile walk from here. Alternativiely from Theale Station, the catch the “1 Jet Black” from The Crown Pub, towards Newsbury. Alight (6 stops) at Spring Inn Pub. Folly Farm is a further 1 mile walk from here. A minibus will be available to collect you from the Wistaria Car Park on Sulhamstead Hill. By car: Leave the M4 at junction 12, and take the A4 exit to Theale/Reading (W). At the roundabout, take the 3rd exit onto Bath Rd/A4 (0.4miles). At the roundabout, take the 2nd exit onto Bath Rd/A4 (1miles). At the roundabout, take the 2nd exit onto Bath Rd/A4. After 0.9 miles turn left towards Sulhamstead Hill and park at Wistaria Car Park, where a mini-bus will collect you. This event has now sold out. If you would like to put your name on the waiting list, please email Rebecca at general@lutyenstrust.org.uk or by phone on 01227 730209. 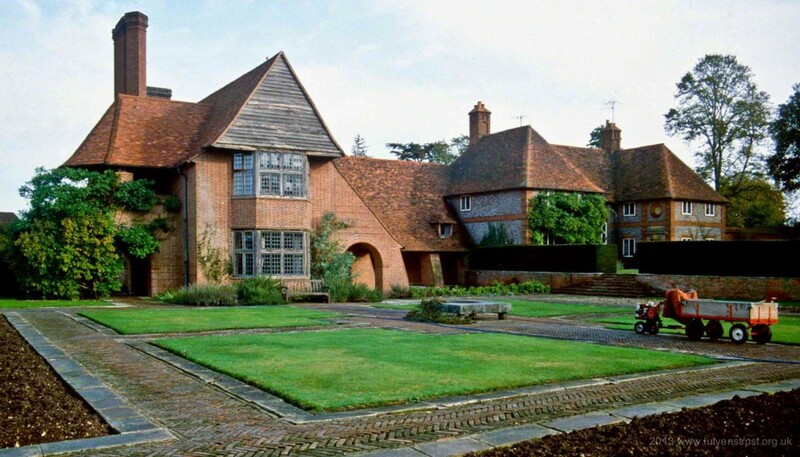 Alternatively, please send your name, address, and email to Rebecca Lilley, Trust Secretary, Danewood, Denwood St, Crundale, Canterbury, Kent, CT4 7EF, along with a cheque made out to “The Lutyens Trust”. Tickets cost £45 including a £10 voluntary donation.